Complete Air Cleaner System- Outlaw HiFlow 587 W/ Black Cyclone Transparent Cover. Complete Air Cleaner System- Outlaw HiFlow 587 W/ Chrome Cyclone Transparent Cover. 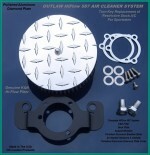 Complete Air Cleaner System- Outlaw HiFlow 587 W/ a Transparent Cover.